I was just at the Boiling Crab in Alhambra last week. Dungeness. Mmm. Good stuff! Finally got the Dungeness eh, WC? I need to do that. It's worth the extra coin compared to the crawfish. Isn't that weird that Macau Street didn't even last one year? I guess word never got around. Ooooh, sounds very delicious and I love it that they have clams since Boiling Crab didn't have clams. The place that I used to buy raw crawfish folded and now I have to rely on eating out to feast my cravings. Thanks for the post, EM and Happy Holidays! Well, my brother said that location just wasn't as good as the one in Monterey Park. So that probably didn't help. I always get the chili crab. Is it flat rate $8.95? Not a huge crab, but a goodly sized one for less than $10 bucks keeps people going to the MP Macau Street. Man, I can't believe Macau Street closed before I ever got there. I always get nervous ordering things by the pound though--how much poundage does one person usually eat? I have a hard time trying to estimate what the tab might be. Elmo, merry x'mas to you as well. Stay away from Ikea $.99 breakfasts. bad bad bad! That's the one thing that has changed. The "Fried Harbor Crab/Deep Fried Dungeness w/dry shrimp, dry scallop, and chili" is now at $12.99/lb. My source, Cecile, says that the owners are the same people that owned Macau Street. Which explains a lot. Least of which is how they got the place transformed so quickly. It's a good estimate to get a pound per person. We had 3 people in my party and we order a pound of the shrimp, a pound of the crawfish, a pound of the clams, a whole deep fried flounder, the noodle soup and spent about $60-$70. We were stuffed. The best deal, though, is the shrimp. What you paying there is meat. The crawfish is definitely the most expensive thing going, pound for pound, since you get barely an ounce out of the whole animal. They had it coming, those buggers. "They do look like little monsters or something. But they're good little monsters". Matter of fact, I've upgraded to the 1.99 breakfast at IKEA. Nah, not really...I just get two $0.99 ones. It did at first, but then a cursory check revealed no crab in the dessert. All is well. Good glory! I'm back in town until the 17th, and once again, am going to your blog for dining-out inspiration. This place looks like a winner! Happy Holidays Senor Elmo! Looks like a good place for some chowing. Course I'm not fond of the mudbugs, but the shrimp and crab certainly whet the appetite. I've been looking for a place like this in the Cerritos/Artesia area for a while, but was disappointed by the "other" new seafood place, the "Seafood Shack" (the crawfish, which are my current obsession, were terribly bland). I stopped by Crablicious to pick up a menu weeks ago, but was scared off my the fact that the menu looked like they were trying to cover too many types of food (which usually means they don't excel at any of them). So, bottom line for me, how were the crawfish compared to the boiling crab? Same to you and yours! If you like destroying crustaceans, this restaurant is for you. Forget about Crab Pot, Joe's Crab Shack. This is the place. The mudbugs are just too much work for too little payoff. The shrimps, though, are money! In my humble opinion, this place beats up Boiling Crab to an unrecognizable pulp. But that's just me. And I love Boiling Crab. The crawfish here seems sweeter, more tender, and all around perkier. And they offer rice (though the corn and sausage you must buy separately -- but who needs em?). Thanks for this. I should try this since I live pretty close. My cousin has been raving about Boiling Crab only to find out that we have one that is similar and much closer. Crablicious has no hour-long wait line, it has the same food, and it's close to you...I think you've got a winner here. This is so off topic, but I have to say that I've stayed up all night to read your reviews...loving them! I also have a suggestion as to where to try next... Favori. Locals rave on the catfish...as do I. It's on the pricey side with romantic ambience. I too have tried Favori and that catfish. Though it was before I started this blog. I'll have to go back soon. Thanks for the reminder. Well, I decided to give this place a shot.. arrived around 5:30p to find it like a ghost town - disinterested staff and nary a customer in sight. But still, based on the words of the great Elmomonster, I went ahead and picked up two pounds of crawfish (mixed flavors) to go. I got home to find that they were absolutely puny (who raided the crawfish pre-school.. and that bag felt suspiciously light). I know they're not really in season yet, but geez... the rest of the crawfish places (yes, I'm slightly obsessed) have em bigger. Now, I'm only complaining because the flavor was... **Amazing**! I really should've gotten some of the other menu items (was by myself though) like the clams or crab, given the great flavor -- and I might do that until the crawfish get up to speed. Thanks again Elmo... you provide (indirectly) good food and (directly) enjoyable writing, two of my favorite things! I was there today too! My second visit. And I was also taken aback with the "disinterested" wait staff. The two people on shift were a young Asian girl and a young Asian guy who were really terrible at providing actual service. They were more intent on wiping down tables more than they were in taking care of us. At odd times, one would check on us, when we didn't need anything, but then later, when I asked for rice, they basically nodded and went back to wiping down more tables. I finally asked the owner and he gave it to me. The sad part was that there was only one other occupied table at the restaurant. 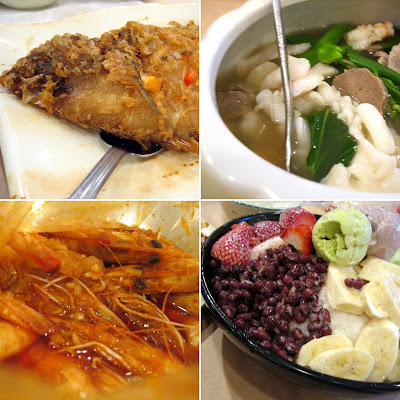 On our first visit, a jolly, heavy-set Korean man served us and boy, we felt like royalty. He catered to our every whim. Without request, he'd refill our glasses, take away empty plates, offered us more napkins. I'm so bummed we missed him today. The food today, however, was just as good as before. They even had a lunch special of shrimp, which was offered at a flat rate of $6.99. The fried fish also went for this price. We did avoid the crawfish this time though, since we were hungry. I didn't mention it in my post, but even at Boiling Crab and other joints, I always feel ripped off at the miniscule amount of meat a crawfish surrenders. Don't be bummed! If you want to see him, go and rent the movie "Batman Begin". You should be able to see him at the beginning who fought with batman. The jolly "Korean" man is actually chinese from Hong Kong his name is Turbo Kong. He does a bit of acting in his free time. Currenty he is setting up another restaurant. Wow! What an awesome name: Turbo Kong. Sounds like he should be the King of all American Gladiators. In any case, someone you don't want to mess with. And he's in Batman Begins?! I have that movie...gotta queue it up again. If you know where his new restaurant is going to be, I'd like to know. Wow! I can't believe the taste. It is soooooo delicous that I can't stop. There's also free crawfish when you eat over $38.00. my boyfriend and I had 2lbs of crawfish and 2lbs of blue crab, the french fries, and the mongolian beef fried noodles. 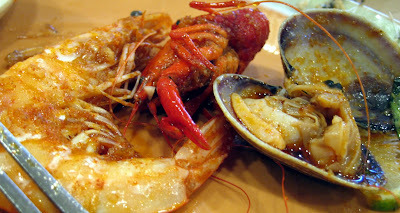 the crawfish and the crab was sooooo delicious, perfectly flavored and cooked. 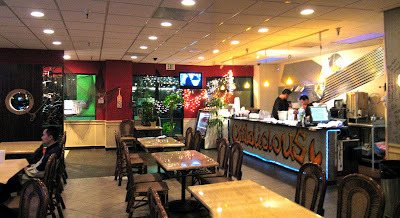 we were surprised because we have tried other various crawfish restaurants such as the famed Boiling Crab and have not found anything in comparison till tonight at Crablicious. The mixed flavor was spectacular with the chunks of garlic and leaves of basil. we also found it to be not as oily as the Seafood Shack. I was putting the left over jus/sauce on the noodles and dipping the french fries in the jus of the crawfish. we will definitely go again! PS...i just posted the last comment...and went back to reading the other comments...the staff was great...a young asian girl and guy served us...and the manager/owner even came by to check up on us. it was his daugther (we think) that informed us about this website. we were impressed with the service and the taste. That's his daughter? Well, in that case, I shouldn't have been so critical of the service. OMG! When i went 2 Crablicious my family and i 8 over $68 and we got FREE ALASKAN KING CRAB LEGS. theres also shrimp, crawfish, fish, chicken, beef and soooo much more. i think u should go and try. it's the best SEAFOOD place iv'e ever been too. Yeah. I agree with you. It's pretty good! People write more reveiws about the restaurant. I never went there before. Is it a good place? Hi EM! My friends and I discovered this place by pure accident. I meant to take them to Macau Street, unfortunately we were too late. The Crablicious experience was pretty great though and we've been frequent eaters there eversince. I am your most avid reader EM! 'Hope you write a review for Crablicious one of these days. Thanks and more power! I've been to several crawfish houses and I have to disagree with you on this one. I went tonight and had the crawfish and shrimp in original and the clams in basil. I have to say both were bland and not very good. Boiling crab is much better. I must agree w/Tan. After peeling off the shell, the meat was terribly bland and overcooked. It was so overcooked that the meat stuck to the shell after de-shelling it. Although the original & basil lemon sauce was tasty, I have to agree that BOILING CRAB beats them all. No... I went to Crablicious tonight with eight of my friends and we all had to agree that it tasted delicious. I went to a lot of crawfish and king crab leg places and this place is number 1! If you don't agree with me then go back and eat then you will see the difference. 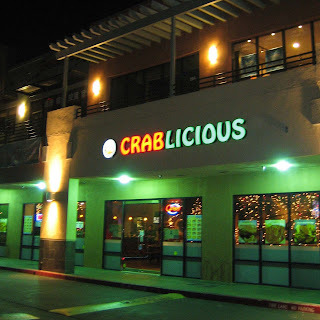 I guess Crablicious has closed for good. The reviews were so yummy that I had to go try. I guess I will just have to keep going to the Boiling Crab.